Jay was a perfectly normal teenager. Awkward, antisocial, and homosexual. He had friends, but only a few. His family were troubled, and he wasn't entirely happy. He was like any other awkward, antisocial, homosexual teenager. Now, Jay has far more on his mind than he can handle. Not only is he struggling to keep his family apart and deal with his unfulfilled love for the hottest guy in school, but he now has to struggle to keep in check his urge to devour human flesh. Decomposition is bad enough, but he can almost deal with that. But how can he deal with life when he's this much of an outsider? 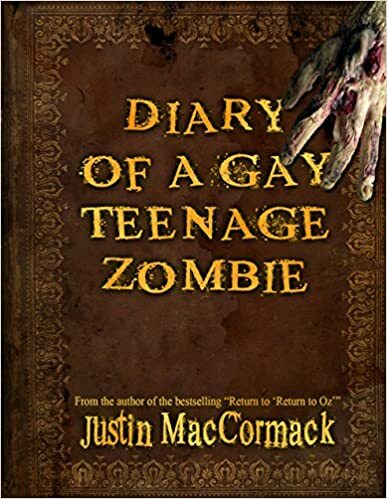 "Diary of a Gay Teenage Zombie" is a young adult LGBT coming-of-age story by acclaimed horror and dark fantasy author Justin MacCormack, creator of the best-selling horror anthologies "Return to 'Return to Oz'" and "Cthulhu Doesn't Dance". This unique tale deals with themes of growing up as an outsider. Shockingly aware and witty, this thrilling story dishes up side-splitting laughter, stomach-churning horror, heart-rending drama and everything you'll need to know about growing up when you just don't feel that you fit in. A different Zombie story. Jay keeps a diary of his life as a zombie, while trying to hide what he is and live as normal a life as possible.